I’ve been slowly working on revamping my little office (it’s really just the corner of my bedroom) since I’ve moved home from college. I’ve only rearranged my room once in the last 4 years (when I decided I wanted a room more suited for relaxing and vegging out in front of the T.V. on winter breaks). Now that I’m really back home, I need the flow and layout of the room to encourage a disciplined work ethic, especially since I need to study for the LSAT and write on deadline! 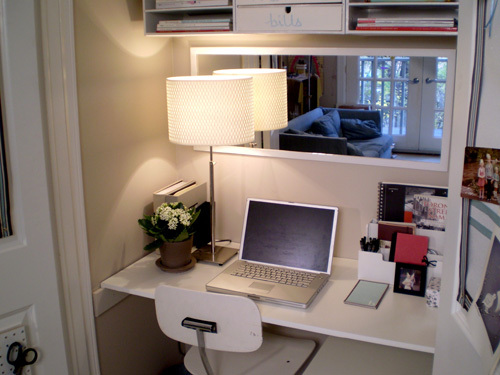 I love the lamp (great textured lampshade) and the mirror on the wall. The mirror reflects light from both the lamp and from the natural light in the window behind the desk, making the space seem larger than it really is. I’m especially drawn to the clean, white simplicity of the whole set-up. The pale robin’s egg blue and white palette is one of my favorite color combos and I’m digging the pop of red tin used as a waste basket. This office-closet was part of a really great and affordable DIY project from Steven and Chris, complete with a manual and list of materials used. I love it! 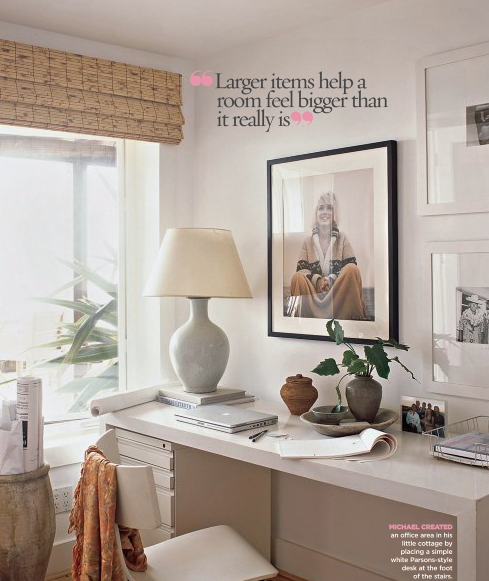 This is a clip from Cottage Living and again, if you a sense a aesthetic pattern here, I really like the clean and simple elements of this space. I especially love the textures used (terra cotta vases, porcelain, bamboo shades) and the inclusion of natural elements with the plants. I think it’s the right fusion of ethereal and earthy. Here again, I’m liking the use of white with pale robin’s egg blue. The creative energy and vibrant colors in this space are awesome! I would love working in a space like this. This is a neat idea with the Japanese-style screen cork board. 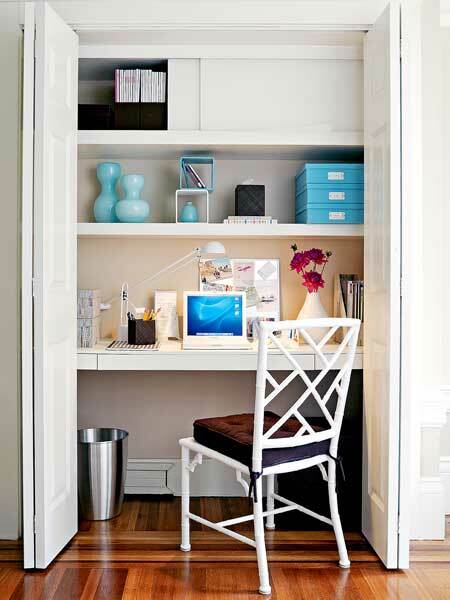 For more ideas like this one and for home office organizing tips, check out Real Simple (don’t get me started on how much I love that magazine!). They have so many great ideas on storing paperwork, knicknacks and general office arrangement. I’ll be back with some real pictures of my own home office revamping project! 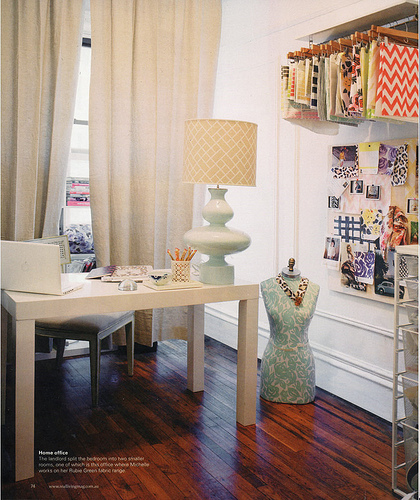 I love the white Parsons desk — and it was just delivered to my home and assembled last week! I’ll put up the before and after pictures of my desk/office project soon.